Congratulations on your engagement to Mr. Darcy! Are you looking for elegant wedding favors for your guests or wedding party? Something beautiful, classic, and very Jane Austen? Look no further. I have personally designed these silhouette favors for you. The gentleman and lady face each other, and their profiles are embossed into the soap using a special stamp. 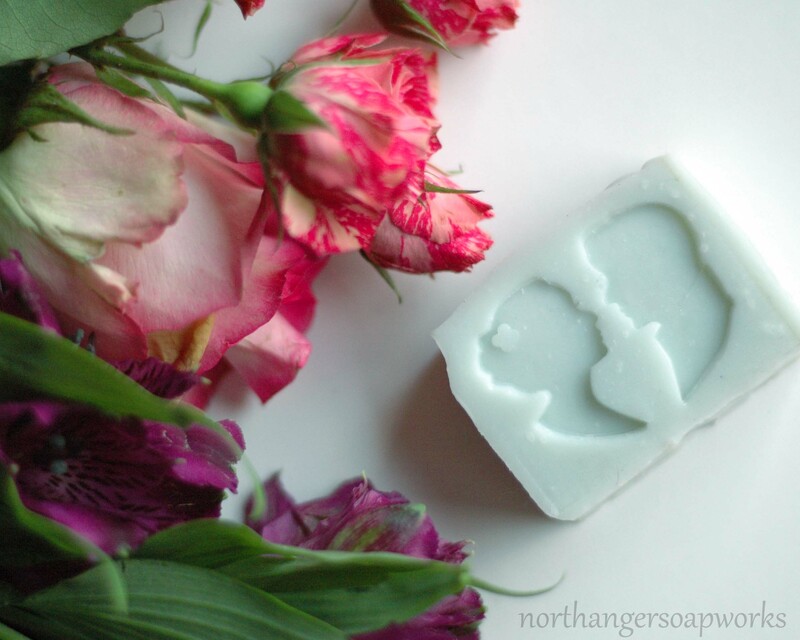 Soap is the perfect favor because it is both functional and beautiful. Everyone uses soap! Pricing is $6 each, with a minimum order of 18 favors. Color and fragrance (if any) is your choice based on my available stock. The list of scents below is a guide, but if you see something in my shop that you prefer as the scent for your soap let me know. 60 day lead time is required as each order is made custom to your specifications. Each soap is approximately 2 ounces, measuring 2.25 x 1.75 x 1 inches. If you need them in less than 60 days there is a 20% rush fee and I cannot guarantee all the scent choices will be available. Contact me directly for rush orders using the form below with your deadline and order specifications and I will let you know if it is possible. Please keep in mind that soap needs 4 weeks to cure before it can be used.